I had the pleasure of sitting down with Taslim van Hattum in New Orleans (where she is based)- the designer and owner of Abiqutie jewelry. 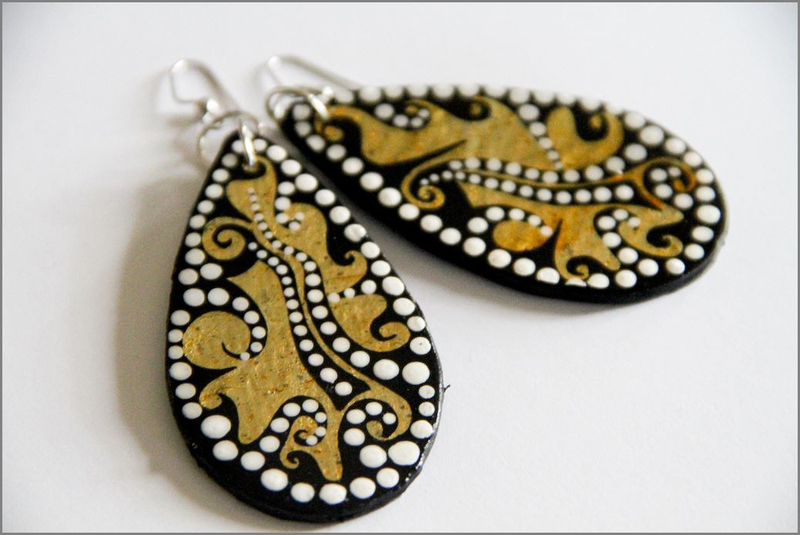 Taslim’s jewelry is handcrafted with family and Muslim roots as well as with the personal style and graceful intellect that Taslim effortlessly exudes. AurumEve: What is your general aesthetic with the Abiqutie brand? Abiqutie: It’s hard for me to think of Abiqutie as an actual “brand”. I actually really think about it as individual objects. Each piece is something unique and of itself in addition to being part of a larger ‘brand’. I was raised by a master carpenter, so the majority of my life has been seeing him make wood into something else in a way that is far beyond traditional– travelling the world and taking different design aesthetics and ideas and reshaping these to inspire pieces. AurumEve: Your line has a very contemporary feel. Is this modern context with a hint of the traditional achieved intentionally? Abiqutie: It comes naturally just from the reality that I am in: a young person, and in tune with contemporary design- so I am able to look upon the ancient; however it is natural for me to re-imagine it with a more contemporary flavor. Aesthetically it feels very natural for my art to be bold and fresh with clean, crisp lines. 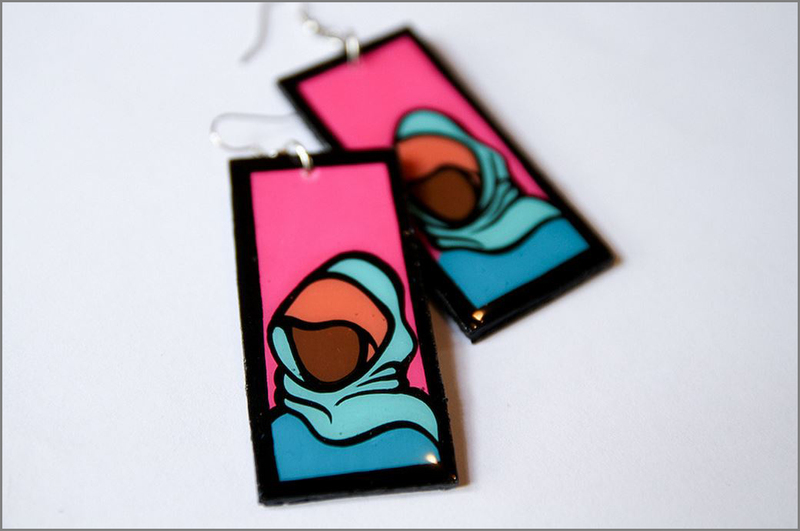 Abiqutie: I grew up in the first self-sufficient Muslim community in the United States in Abiquiú, New Mexico. It existed up until the mid 90s but is now a very different community and no longer cohesive or self-sufficient. So after many travels I ended up in New Orleans for graduate school to study Social Work and Public Health – then Katrina hit. When I returned afterwards, I couldn’t justify leaving New Orleans with the skills that I had when it was needed so much here – and it’s New Orleans, it has a good way of keeping you here. I’ve stayed and I love it. You can do anything here. Abiqutie: Within everything I am Muslim woman. So there is a need to incorporate my identity within my work. 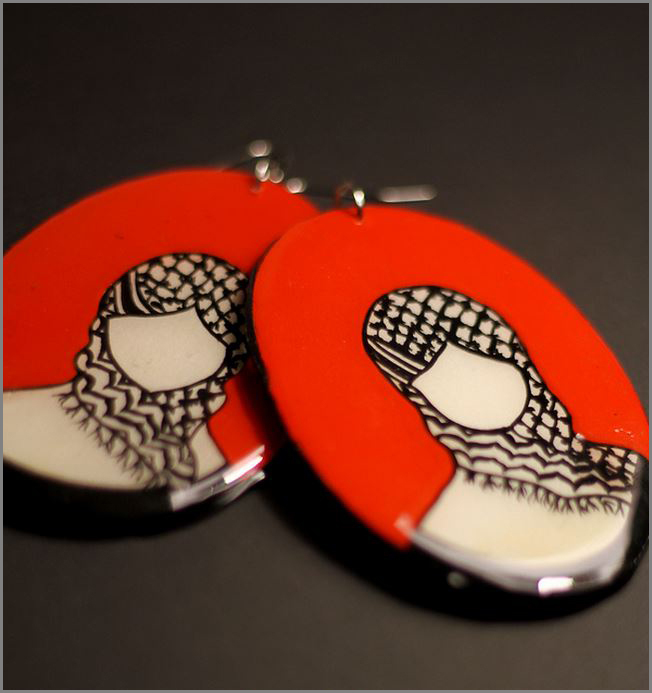 The faceless representation of the Muslim woman is very intentional. 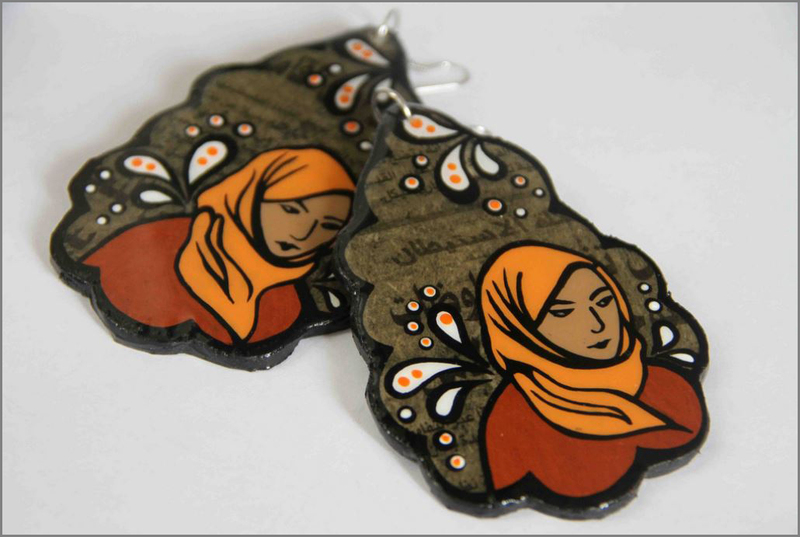 Not all Muslims feel comfortable with facial representation within art, so this is meant as a sign of respect for those beliefs, but also knowing that I want these women to have jewelry that they find representative that is not conflicting with religious beliefs and also with the many varying skin tones of Muslim women around the world. 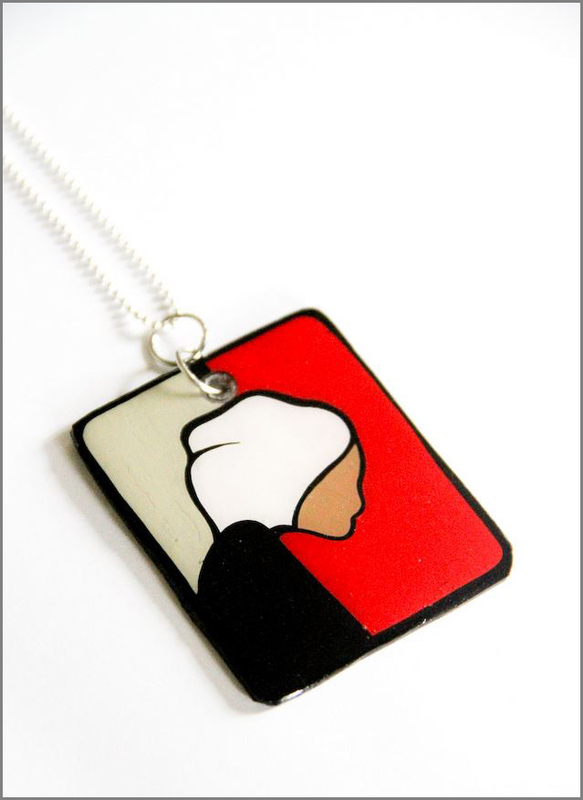 I find another part is very intentional in that I make art, and to make jewelry that have Muslim women in it is a nod to the fact that we are faceless within this country and society as a whole. Oftentimes when we exist within spaces, the only thing some may see is a scarf. It presents a political reality which I find very present. There were woman who said I want a pair and I want it to look like me- and I understood that, because the first pair I had made was for myself. 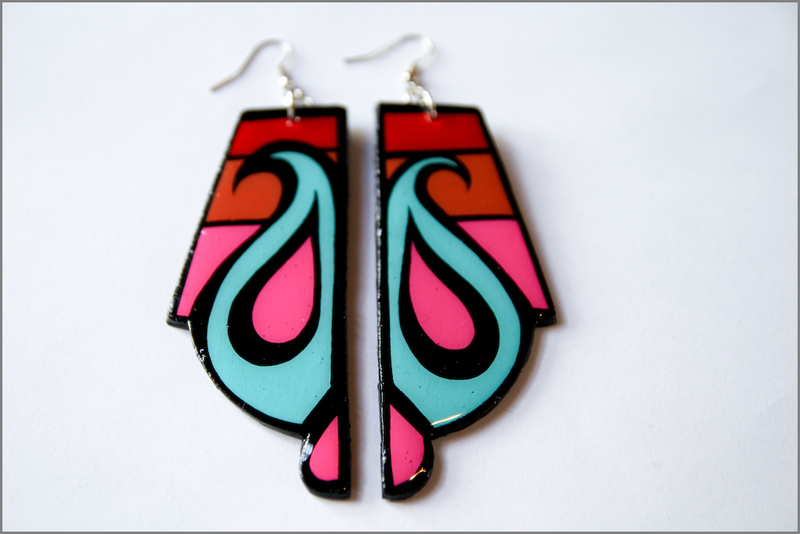 The first pair I made was my wedding earrings. 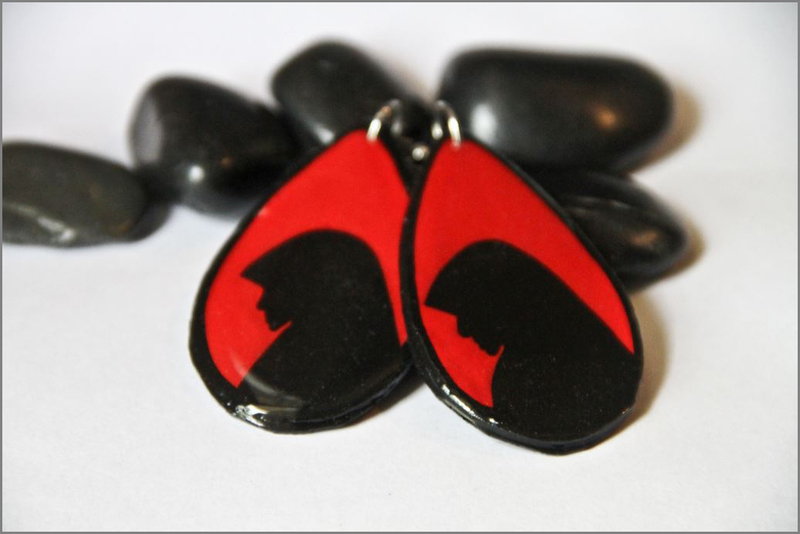 Many people asked both were I purchased the earrings and how they could get a pair for themselves! 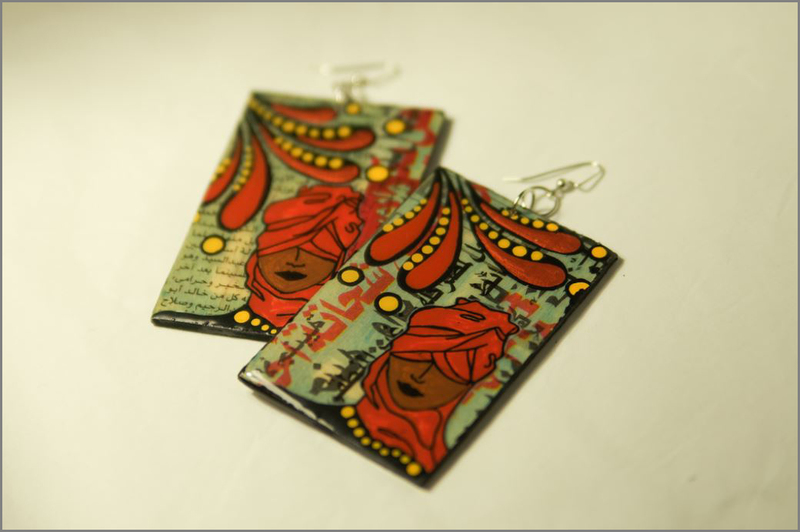 AurumEve: Who is the exception, the woman on your earrings whose facial features are shown? Abiqutie: There are a number of exceptions; there are some with half of their face showing. For some pieces, there is no ‘deep’ meaning, but when I look at particular pieces aesthetically, I want a face; I’m ready for that with the particular piece. 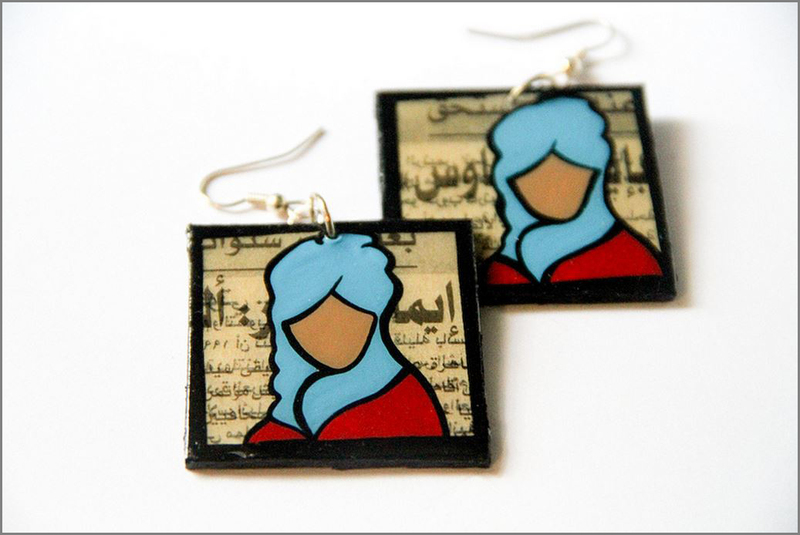 Abiqutie: The majority of people who buy my art aren’t Muslim. 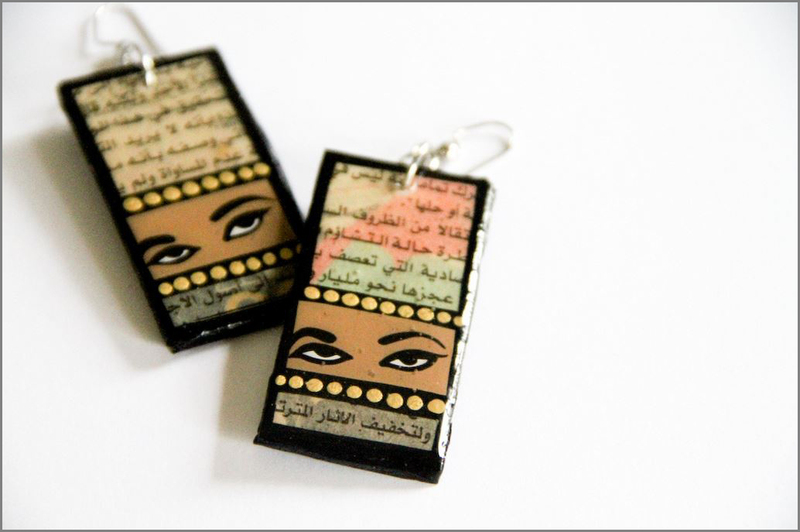 I’m always shocked by how many women buy the women’s faces pieces -it’s interesting because when I create them, I see them as very Muslim. A man at one of my trunk shows bought all of the artwork with women on it for all of the women in his family. When I inquired, he said that the pieces were made to look like the Virgin Mary as well, which threw me, because I had never thought about that; he had seen such a different religious interpretation within in, which I found so exceptionally beautiful. There’s a part of me that also thinks that there is a deep resonance with this woman within many different cultures-I think it would resonate with women regardless, like African American women’s identity being defined solely by race as opposed to the many aspects that make up the woman. 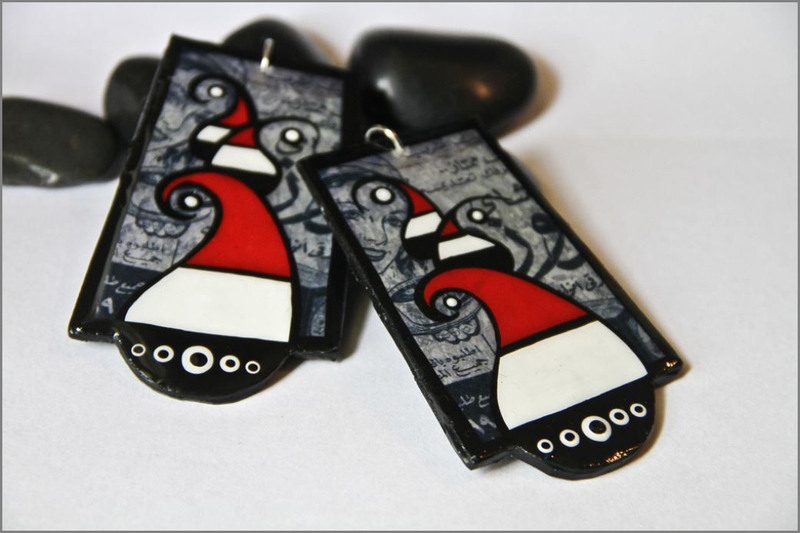 I have a lot of older women who buy because they want to wear big jewelry and want something lightweight like my pieces. I am not sure what else it is…excellent fashion sense? AurumEve: Did you have a jewelry tradition within your family or rite of passage? 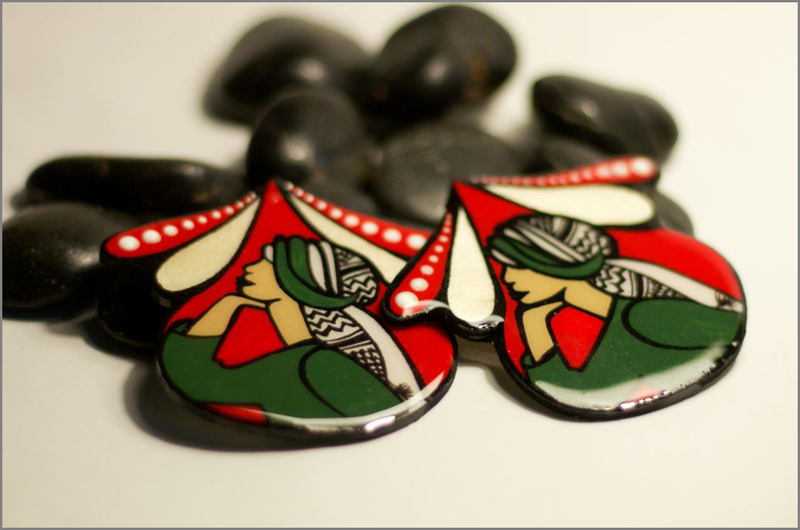 Abiqutie: My mother collected antique Palestinian jewelry from her trips to Palestine and from my grandmother. It was beautiful: fine metal worked jewelry with Arabesque designs- and I was completely in love with all of it. Our house was robbed and it was all taken. The man was caught and brought in and the police managed to recover everything. I remember my mother going to the police station and being told she couldn’t get her the pieces back unless there was itemized proof that they belonged to her. I remember her going through old photo albums searching for photos of her wearing the jewelry. In the end nothing was given back. So I have very profound memory of my mother wearing this beautiful jewelry when I was younger and then a very abrupt stop, in a very violating way. I remember a distinct transition from her away from jewelry. And I remember really missing it, so maybe my right of passage was the opposite and in my adult life I felt the need to really replace that for her. Now I make her pins. She wants all of my designs as pins for her wraps. Maybe the right of passage was that it was taken instead of given. AurumEve: Where do you see the future of Abiqutie? Abiqutie: I’m not sure; if I felt uncomfortable with how big or how small this ends up being then I’d be more inclined to say- yes I’d like a store, or yes, let’s go global. I’m really content with Abiqutie having its own journey, even if it is that I make a few pairs a year for my sisters- or it in fact morphs into something bigger and I have a store- because for me, it’s really about enjoying the process. For me there’s nothing that I enjoy more than painting the products and working with the materials and I think as long as I continue to enjoy that, I’m okay with where ever it goes. All images courtesy of Taslim Van Hattum. 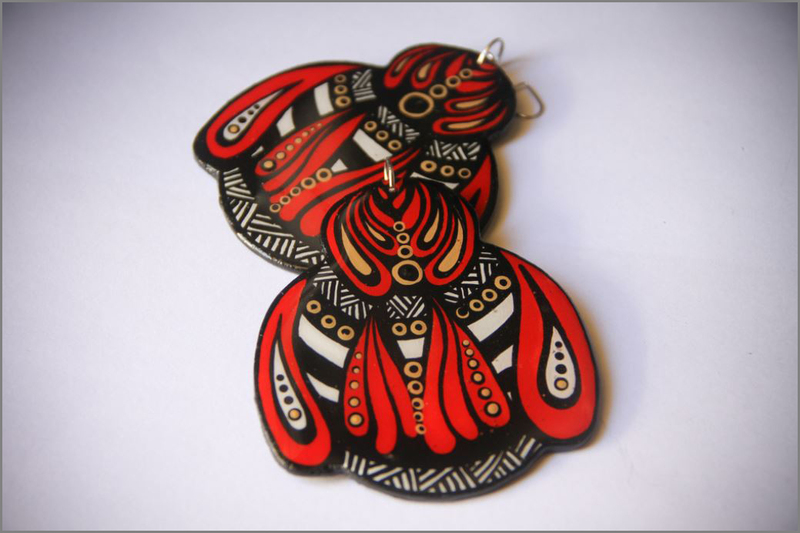 What I love about her pieces is that there is a strong sense that her pieces are more than just art or fashion. I understand that culturally the identity of a woman plays a role in her designs, but i found it fascinating that different people read it as different things. 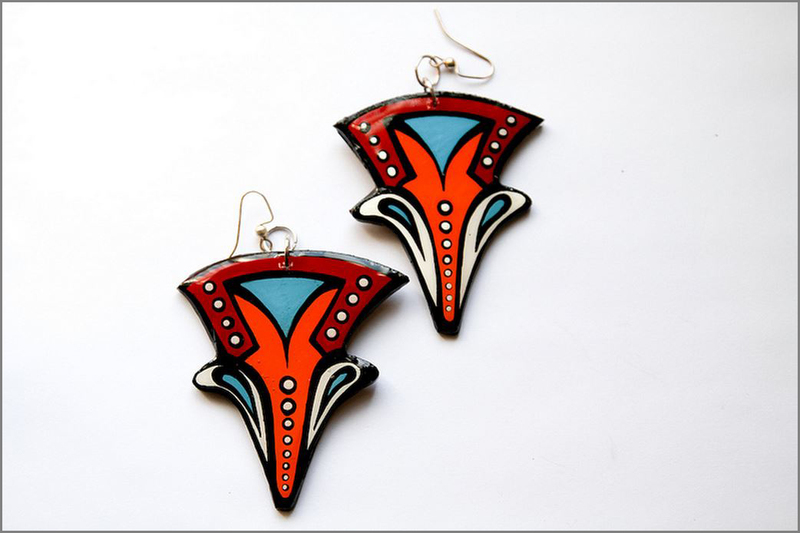 There is a level of feminism that is evident in the design of the pieces but the colors and the blank faces crosses cultural boundaries. Her work looks like it can easily be transformed into a series of paintings and sculptures too! Its really powerful stuff. 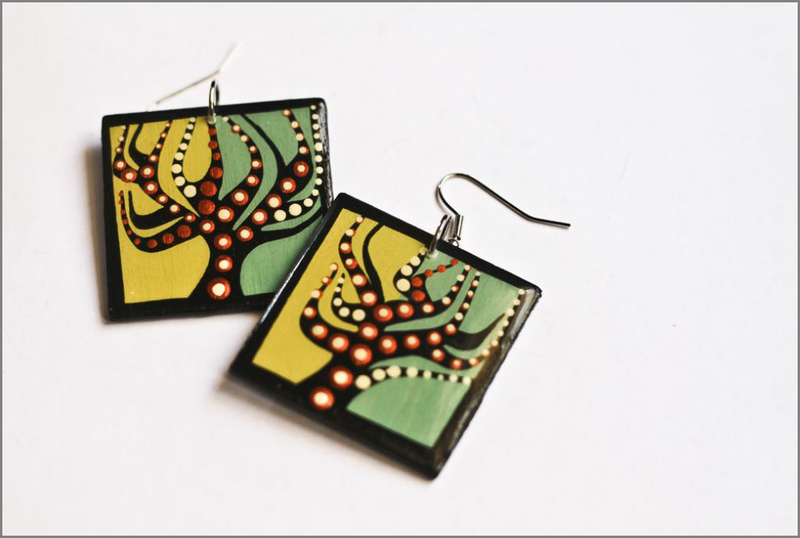 I love the pieces and each piece makes me feel empowered . The woman’s, faces, profiles, silhouettes are so beautiful they make me feel so proud to be a woman. Great interview!! Thanks so much! Her work has a very subtle political and defintely feminine tone, I love it! Interview well done! I find Taslim’s pieces interesting but mostly her vision of her pieces is what I found fascinating. It’s great that she is able to translate so many facets of her life into her art. Thanks for the comment! Her vision is really great, and it was so great to interview and meet Taslim, she is so interesting and eloquent and fun! I love the pieces, great job on the interview.